Filipinos face risks and disasters as a people continually. In the last two decades alone, the Philippines endured over 274 natural disasters, and is certain to face more in the future. The country ranked third among the most vulnerable out of 171 countries surveyed in the 2016 World Risk Index. Cultural and socio-political issues make us prone to man-made disasters. All these are compounded by economic inequalities, weak governance, depletion of resources and the global reality of climate change, among others. Despite all the hardships, Filipino spirituality is unshakable. Surveys point out that over 90 percent of the population still identifies with a religion. The Philippine Trust Index in 2011 places the Church as among the “most trusted” institutions. The numbers prove that religion holds a resilient connection with the people, a privilege that extends to faith-based organizations. People still look to faith leaders for counsel and hope, especially in challenging times and emergency situations. Faith moves millions to engage in volunteer work. In this context, the Philippine Faith-based Organizations Forum (FBO PH) brings together local faith communities, primarily the constituents of the three Christian councils, to unify efforts in reducing disaster risks and in responding to the humanitarian needs of those affected by various disasters. People of faith are all over the country, even in its remotest corners. Our presence allows us a degree of familiarity with the context of the affected. In times of crisis, we are in the communities first through our social and material capital. A meaningful past makes people communicate with us easier. Our sustained presence is also an opportunity to teach preparedness and resilience. No other humanitarian and development organization is service so essential in its self-understanding. We may hold diverse theological and doctrinal opinions and traditions, but compassion and love, above all else, call us to transform our faith into action. Our work prompts us to seek out peripheral communities and journey with them as they reclaim their dignity. We have mustered networks in the national and international arenas, to whom we bring the stories of need and triumph from the ground. 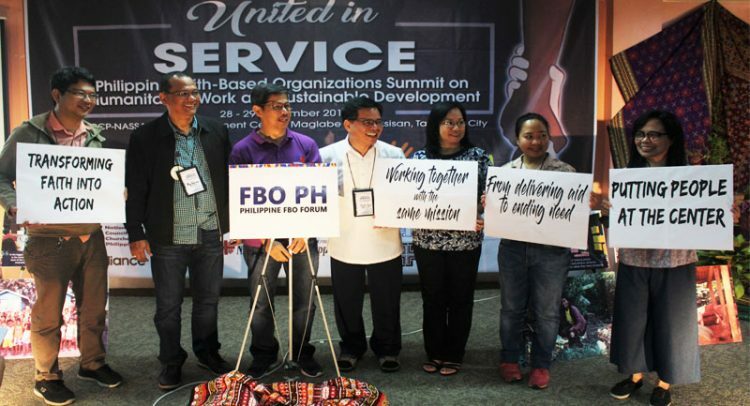 To more effectively deliver our mission of transforming lives for the better, we begin our journey as the Philippine FBO Forum (PFF) on November 28, 2017, in Tagaytay City — in an FBO Summit convened by Catholic Bishops’ Conference in the Philippines through NASSA/Caritas Philippines, NCCP-ACT Alliance and PCEC-Philippine Relief and Development Services. Through this historic platform, we bring together local faith communities, primarily the constituents of the three Christian councils, and other faith-based groups, to unify what had hitherto been separate efforts in reducing disaster risks and responding to the humanitarian needs of those affected by the various disasters in the country. We will amplify the voices of communities and ensure their participation in all levels of our engagements, because the people are at the heart of our work. We will seek venues to listen to the sentiments of those affected by disasters and those vulnerable to their effects. We will coordinate our responses and explore areas for collaboration whenever possible. We will collectively address common challenges, especially around the themes of trained human resources, funding and sustainability. We will call on one another to fellowship, celebrating one another’s strengths and achievements, learning from each other as we move forward together. We will consult one another and seek counsel from other reliable actors in humanitarian and disaster risk reduction for best practices and effective troubleshooting. We will, whenever possible, articulate a solid stance on important policies, especially in relation to DRRM and humanitarian work. We will monitor the programs of the government in DRRM and humanitarian work, as they have the primary responsibility to build resilience in the communities. We will uphold globally-recognized humanitarian principles, especially the Core Humanitarian Standards, to ensure quality and accountability to each other and those we serve. Because the work of transforming lives is not our own, we will network with other civil society and nongovernment organizations, community initiatives, foundations, academic institutions and other relevant organizations. We stand for the sanctity of human life, uphold people’s dignity and respect human rights. Thus, we declare our belief in God our Creator, Jesus our Redeemer, and the Holy Spirit our Comforter. We sound our call to others to collaborate with us as we plant seeds of peace based on justice, transformation and reconciliation so that all may experience abundant life. “May your Reign and will be done on earth as it is in heaven!” Amen.